The Empowered Committee on VAT will take a final decision on tax treatment of petroleum products by this month-end. The move comes in the face of rising fuel costs due to increase in tax rates on petroleum products and severe revenue loss to some states. The recent improvement in ties between India and Pakistan promises distinct benefits for both countries, if the thaw translates into lasting peace on the subcontinent, said Standard & Poor’s Ratings Services today in a commentary. Walk into her splendid Sector 9 house with its stark and stylish interiors and you are face to face with the petite Vardhman heiress who has shown that daughters are in no way inferior to sons when it comes to not just handling family business but also expanding it. The MG Rover plant shutdown in the UK would not only make staff in the parent plant redundant but would also inflict losses to its ancillary units across the globe. 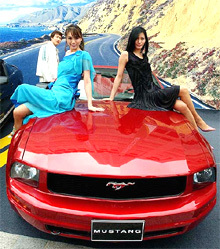 South Korean models pose with Ford’s new Mustang during a press unveiling in Seoul on Monday. The new Mustang, priced at 42.7 million won ($ 41,862), is equipped with V64.0L engine. The efforts made by the Ministry of Tourism to preserve and promote tourism at the Ajanta and Ellora caves has led to it bagging the 2005 PATA Grand Award for Heritage for its Ajanta Ellora Conservation and Tourism Development Project. The organisation has recognised the effort put in by officials to gain the trust of the community and the local authorities to effectively conserve, restore and promote the UNESCO World Heritage Site as a high quality tourist destination. Liberty Shoes Limited, a Karnal-based footwear maker with an annual turnover of over Rs 350 crore, has announced to expand its business, and aims to achieve a growth of 15 per cent in business volume this year. Yes Bank, the youngest Indian bank, today signed a $ 20 million (Rs 87 crore) US Government loan guarantee to promote lending to small and medium enterprises for projects in energy, environment and water sectors. With the state government having failed to address the basic demands for a speedy clearance system and a proper infrastructure, investors in the Baddi, Barotiwala and Nalagarh industrial areas had started shifting to Uttaranchal and Jammu and Kashmir. With growing strength of the pharmaceutical and healthcare sector, India is fast emerging as a destination for patients from abroad. Though public healthcare system has still to fulfil the expectations of the public, the organised private healthcare sector is growing at a fast pace. Healthy sales of passenger cars, motor cycles and commercial vehicles enabled Indian automobile industry to grow 15.9 per cent at 78,96,475 units in the domestic market in the fiscal ending March 31, 2005. The Empowered Committee on VAT will take a final decision on tax treatment of petroleum products by this month-end. The move comes in the face of rising fuel costs due to increase in tax rates on petroleum products and severe revenue loss to some states. States like Delhi and Uttar Pradesh will have to face revenue loss from diesel till the VAT panel resolves the issue of floor rate of tax on petroleum products on April 26, state government officials said here. Sources said Delhi may have to take out diesel from VAT list as Empowered Committee chairman Asim Dasgupta made it amply clear that petroleum products will be out of VAT as their prices are not market-determined. “Petroleum products are still out of VAT. There will be no deviation. The reason why petroleum products have been kept out of VAT is that they are not marketable commodity and fall under administered price mechanism,” Dasgupta said. Delhi has imposed VAT on diesel at 20 per cent, which is much higher than the earlier sales tax of 12 per cent. Uttar Pradesh also charges 20 per cent sales tax on diesel. In contrast, neighbouring states like Haryana and Punjab have kept it at 12 per cent and 8.8 per cent. Empowered Committee earlier decided on a minimum tax rate of 20 per cent on diesel. Delhi government has admitted it has lost revenue by 40 to 50 per cent during the first 13 days of imposition of VAT. Chairman of Empowered Committee on VAT Asim Dasgupta will soon meet Defence Minister Pranab Mukherjee to resolve the issue of VAT on items sold to servicemen through army canteens. “I will meet the Defence Minister soon,” Dasgupta told PTI when asked when would the issue of imposing the new tax on items sold through army canteens be resolved. He declined to comment on whether army canteens will be exempt from VAT. “How can I tell you beforehand what we are going to decide,” he said. More than 1,000 army canteens remained closed for three days soon after VAT was introduced early this month as they were gearing up for new billing software. Although senior Defence personnel flayed the decision to impose VAT on over 2,000 items sold through army canteens, the Finance and Defence Ministries are yet to resolve the issue with the VAT panel. “The likely rewards for Pakistan can be largely defined in concrete economic terms, the combined effect of which would boost the country’s positive credit rating trajectory,” said Standard & Poor’s credit analyst Agost Benard. “For India, the benefits would be of a less tangible nature, with lasting peace bolstering its international standing,” the study said. The key benefit for Pakistan would be the reduction in its military spending, which would free up funds for social needs that would improve the standard of living and economic productivity. The reduced expenditure could result in better fiscal balances, in turn accelerating the reduction of Pakistan’s substantial debt. The normalisation of relations with India would also unlock the vast potential for cross-border trade and investment, it said. Although there would be tangible gains from increased trade with Pakistan and easier access to Iranian gas via a proposed pipeline through Pakistan, these would be less significant to India because of the comparative size of its economy over Pakistan. India’s greatest mileage from a deep rapprochement with Pakistan would accrue from its improved standing on the world stage and with the U.S.A, which could lead to better trade and defence relationships with the superpower, the study said. Walk into her splendid Sector 9 house with its stark and stylish interiors and you are face to face with the petite Vardhman heiress who has shown that daughters are in no way inferior to sons when it comes to not just handling family business but also expanding it. She is Suchita Jain, Executive Director, Vardhman Spinning and General Mills, and daughter of Mr S.P. Oswal, Chairman and Managing Director, Vardhman Group, with a turnover of $ 400 million. Now Suchita is the Business Head, Fabric Division, in the group with a turnover of Rs 280 crore with its manufacturing plant in Baddi and is responsible for the topline and bottomline of the business to the group chairman. Suchita, smart in a brown striped shirt and trousers, says: “It would be easy to say that all was laid out for me and I was born, as it were, with a silver spoon in my mouth. But that is not the truth. I always had a business sense and put myself in the work with great passion. The only child of her parents, Suchita studied in Sacred Heart Convent at Ludhiana and then did her B.Com and M.Com from the Government College there. “I did my M.Com in 1989 and stood second in Panjab University and won a gold medal from my college. I was restless and driven to do something. I started going to the office at Ludhiana in 1990 when I was only 23,” she says. In 1992, she spearheaded the groups’ foray into fabrics. Today, the company manufactures 25 million meters of fabric per annum, which goes for apparel making. The initial period was of learning and her unit made losses for the first three years but from the fourth year onward there has been no looking back for this Vardhaman girl. This businesswoman reveals it was not easy managing home and work but she was able to strike a balance. “I manage to do my work and also give quality time to my daughters Saumya and Sagrika, she says. The MG Rover plant shutdown in the UK would not only make staff in the parent plant redundant but would also inflict losses to its ancillary units across the globe. The same is the apprehension among the workers in Sonalika Tractors at Hoshiarpur, Punjab. The Indian angle to the it’s-curtains-for-MG Rover episode is that Hoshiarpur-based Sonalika Tractors Limited had entered into a tie-up with MG-Rover for manufacturing sports utility vehicles (SUVs) at Amb, a tax-free zone in Una district of Himachal Pradesh. The vehicle was to be manufactured under the banner of a newly-formed company, International Cars and Motors Limited. Sonalika had also entered into an agreement with an MG Rover auto-part supplier, Power Train, as a supply chain partner for common rail diesel powertrain programmes. A few transmission parts of the car’s engine and gearbox components were to be manufactured. Both these pacts took place in March 2004. A year later, with MG Rover plant’s shutdown, the entire production chain may be affected down the line, including at Hoshiarpur. “It was, in fact, a component outsourcing agreement between Sonalika Tractors and Power Train. More than 5,000 engine parts per month were being manufactured for the UK-based auto giant. With the closure of the main plant in the UK, production is likely to be hit,” sources in the Hoshiarpur plant said. The sources also added that there would be a series of lay-offs at MG Rover’s main plant and its subsidiaries globally and were apprehensive about its impact on Hoshiarpur-based sub-ancillary. Talking to The Tribune, Mr L.D. Mittal, Chairman, Sonalika International, said that the UK auto-giants’ closure has been in their favour. “We already had taken the technological know-how for SUV from MG Rover and had to pay them royalty. If the Rover plant comes to life, we will pay them,” he says. “I can also assure that there will be no lay-offs in our Hoshiarpur unit on this account,” he adds. The efforts made by the Ministry of Tourism to preserve and promote tourism at the Ajanta and Ellora caves has led to it bagging the 2005 PATA Grand Award for Heritage for its Ajanta Ellora Conservation and Tourism Development Project. The organisation has recognised the effort put in by officials to gain the trust of the community and the local authorities to effectively conserve, restore and promote the UNESCO World Heritage Site as a high quality tourist destination. The awards were presented at the 54th annual conference of the Pacific Asia Travel Association (PATA) which began its session at Macau Sar in China today. There was recognition for the public sector Indian Airlines ,which got the Gold Award for effecting service turnaround to perception turnaround. Thomas Cook, India, Limited received the award for Tour Operator/Travel Agent while the Welcomenviron of ITC Hotels, India, got the Corporate Environmental Award. The Union Ministry of Tourism also bagged a Gold Award for its Print Media Advertisement — “Incredible Taj”. The Multimedia and Journalism award went to SITA, India for its Consumer Travel Brochur, India Quest, Premium Vacations. Kerala Tourism secured the E-Newsletter award for its newsletter and also bagged another one for heritage and culture for “A day with the masters” and Capt C P Krishnan Nair of Leela Hotels was presented the Award of Merit for his work in “greening” the Leela, Mumbai, and many public places in the city. The company has bagged a major order for supplying shoes to the world’s leading retail chain, Walmart. For this, the company is expanding its manufacturing capacity. It is already exporting leather shoes and other products worth over Rs 70 crore under its brand and outsourcing for other brands. Talking to The Tribune, Mr Anupam Bansal, Director, Liberty, said: “Now we are diversifying our business into the ceramic business by setting up plant in Rajasthan estimated to cost Rs 30-40 crore,” he said. Yes Bank, the youngest Indian bank, today signed a $ 20 million (Rs 87 crore) US Government loan guarantee to promote lending to small and medium enterprises (SMEs) for projects in energy, environment and water sectors. “It will spark private lending to SMEs that aim to commercialise renewable, efficient energy and water technologies, products and services,” Yes Bank CEO and MD Rana Kapoor told a news conference here after signing the agreement with the United States Agency for International Development (USAID). Yes Bank will provide the entire debt component of $ 20 million for 8 to 12 projects and the US guarantee covers 50 per cent of net principal loss in case of default. Inquiries revealed that quite a few industrial units which had set up one unit here were now opening their ancillary units in Uttaranchal. Not only this, many investors after buying land worth crores had given up the idea of setting up industries and left for either Jammu and Kashmir or Uttaranchal. Mr S.K Ghosh, vice-president of the PHD Chambers of Commerce and Industry, opined that the government in Uttaranchal had facilitated the investors by providing them all clearances within 15 days while it took almost one and a half months here. Not only this, plots there were well carved out right from Roorkee to Hardwar while here one had to get the land- use changed, which was a time- consuming exercise. The fact that the floor area ratio (FAR) permitted by the Town and Country Planning Department was 1.50, 1.25,1.0 and 0.60 for small scale, light, medium, large and heavy industry, respectively, a large portion of the land could not be utilised for construction. The Town and Country Planning Department had generated revenue worth Rs 1.8 crore towards land- use change and planning in two years from the district. An amount ranging between Rs 50,000- Rs 10 lakh had to be incurred by an individual investor for getting land- use changed. The Industries Minister, Mr Kuldeep Singh, said the government was serious about providing the infrastructure facilities and private players were being roped in for the purpose. He said hectic planning was on to set up an industrial development authority which would ensure that revenue generated from investors was used for providing them better facilities. A report of the PHD Chamber of Commerce and Industry (PHDCCI) on the sector has claimed that at present the healthcare industry in India is worth Rs 1,00,000 crore and employing over four million persons. The country has immense potential for promoting medical sector and the industry is expected to grow in size to Rs 2,70,000 crore by 2012. “ The sector is growing at a rate of 15 per cent for the past five years. By 2012, it is expected to touch 25 per cent of revenues of private upmarket players, adding up to Rs 10,000 crore to the revenues of major players,” said the PHDCCI report. The chamber emphasised that it was high time to reorient the country’s healthcare strategy and strengthen linkages between the government and the private sector. The figure stood at 68,10,537 units in 2003-04. Passenger car sales moved up 17.7 per cent to 8,19,918 units in the just-ended fiscal from 6,96,153 units in the previous year, according to figures released by Society of Indian Automobile Manufacturers (SIAM). Buoyed by the growth in the economy and easy finance options, most of the carmakers saw good demand in the market. Top carmaker Maruti Udyog’s sales moved up 16.5 per cent to 4,17,179 units while Tata Motors, the number two carmaker, saw sales moving up an impressive 33.9 per cent to 1,44,827 units (1,08,138). Hyundai India, which has seen a spurt in demand in export markets, recorded domestic sales at 1,41,830 units against 1,29,472 units in 2003-04. Car sales in March this year were up 18.5 per cent to 89,493 units against 75,476 units in March 2004. In the motor cycle segment, Hero Honda and Bajaj Auto powered sales to a 19 per cent growth in 2004-05 to 49,64,442 units against 41,70,445 units in the previous fiscal. Sales in March stood at 4,36,727 units against 3,69,309 units in the same month in 2004, witnessing a growth of 18.2 per cent. It was Hero Honda and Bajaj that saw the sales graph move up as they cut into sales of other mobike makers. Hero Honda, which increased its market share by two per cent to almost 50 per cent, had sales of 25,57,385 units in the domestic market at a growth of 25.7 per cent. Bajaj Auto’s sales crossed the million mark in the domestic market to 13,44,922 units in 2004-05 against 9,73,307 units in the previous year, a growth of 38.1 per cent.